Storing your reviews in OwnerRez is very important. Learn why by reading our Reviews Overview article. 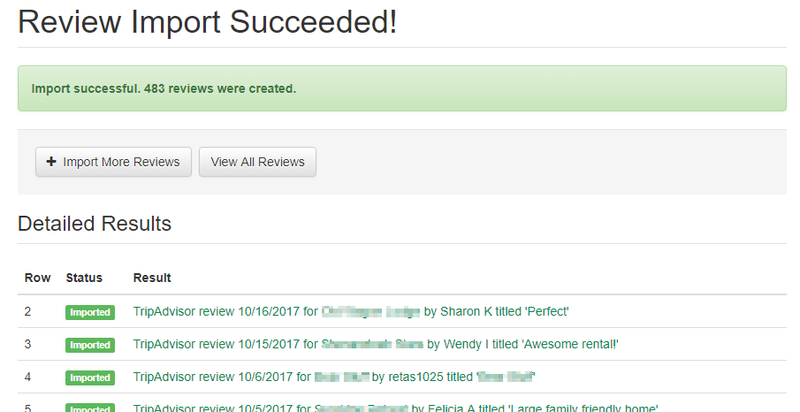 You can store reviews in OwnerRez by either manually entering them one by one or by importing them in bulk via Excel. This article will cover importing them in bulk via Excel. When a guest writes a review on a listing site, social media website or in a guest comment book, you can import them in bulk by following these steps. Our import process relies on a specific Excel template that must contain certain columns. To find the template to use, go to the Import Reviews page in OwnerRez. This import screen is linked to from the Tools menu and on the Reviews overview page above the grid. 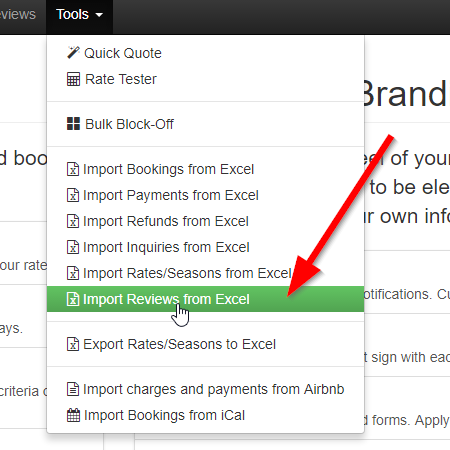 On the Import Reviews page, you'll see some basic steps and the first step will link to the Excel Template. Click on that link and download the Excel Template. After you have the correct Excel template to use, the next step is exactly what you think it is - fill it in with your reviews! 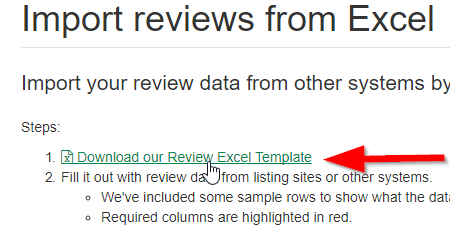 For the most part, the columns you see in the Excel template are exactly what they sound like, and they mirror the fields you see when entering reviews manually. The columns highlighted in red are required, so make sure something is entered in those columns for every row. When you're finished filling in your reviews, click the Save button in Excel to save your spreadsheet and then move on to the upload step. Once you have a full Excel spreadsheet of reviews to upload, it's time to upload that into OwnerRez. Back at the Import Reviews page, click the file (or "Choose File") button in your browser to attach the Excel spreadsheet you just finished working on. If you see error messages, don't get stressed out or walk away. There are a lot of validation issues that can cause error messages to be returned. Carefully read the messages and think about what it's saying. We have designed our import engine to provide very clear specific messages that tell you exactly what row/cell is wrong in the Excel file and why it's wrong. First find the row in Excel that the error message is referring to, then read the error message and think about the column/data it is talking about. Most of the time, you'll be able to understand and correct the problem. If you still don't understand, feel free to contact us directly and we'll lend a hand. If errors are returned, nothing was imported. The import engine will automatically rollback any successfully-imported rows so that you can fix the problems and try again without worrying about duplicate reviews being created. So keep fixing the Excel spreadsheet and trying again until you see green! There are a couple of common problems that users tend to run into. If you have a problem when importing reviews, check out the below sections to see if one of these sounds familiar. If it's something else other than what we have below, shoot us an email and we'll let you know what's going on. The biggest problem when importing reviews tends to revolve around property match-up. That is, the mapping of which OwnerRez property the review is associated with. It's important to understand how the import engine uses the columns in the Excel template to figure out which OwnerRez property the review goes with. The OwnerRez Property Id column should reference the ID or name of the property in OwnerRez. This is the ID and name shown on the Properties grid. If using the property name, it must exactly match the name that shows in OwnerRez. This column is checked before anything else. If the ListingSite and ListingSitePropertyId columns are filled in, we'll check to see if there's a matching property mapping for that listing site in your OwnerRez account. To check your listing site property mappings in OwnerRez, go to Settings > Listing Sites > click the relevant listing site > look at the "Property Mappings" section. This shows the IDs you've configured that map your OwnerRez properties to the listing #'s for that specific listing site. Listing sites that are owned by the same parent company are checked together. For instance, TripAdvisor property mappings might be under the FlipKey listing site or vice versa; HomeAway and VRBO property mappings are checked together; and so on. Each row of the spreadsheet is evaluated independently so you can mix which method you use row by row to match up properties. In designing our reviews system, we made sure to size our review bodies and owner response fields so that all of the known/major listing site content would fit. You can enter up to 10,000 characters in the review body and up to 5,000 characters in each of the owner response and private feedback fields. The other fields - Display Name, Title - should also be sized to fit whatever type of review you get. However, if that's not the case, do your best to enter what will fit and then let us know. We will update the system if this becomes an issue.